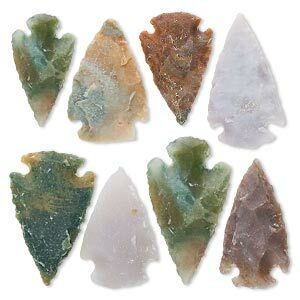 Focal, fancy jasper (natural), 1- to 1-1/2 inch hand-knapped arrowhead, B- grade, Mohs hardness 6-1/2 to 7. Sold per pkg of 8. Item Number: H20-5701FY Have a question about this item? 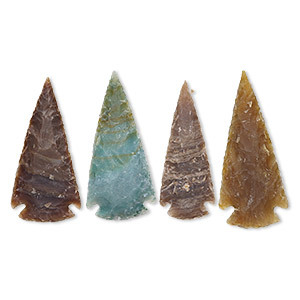 Striking arrowheads are hand-knapped from natural fancy jasper. 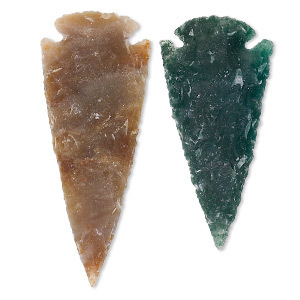 Knapping is the art of cleaving and shaping an object by chipping one stone against another. 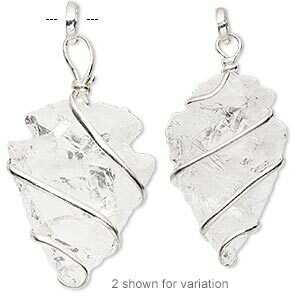 A popular style for Native American designs, the arrowheads can be wire-wrapped to add in jewelry. Sizes, shapes and colors may vary with handcrafted items. 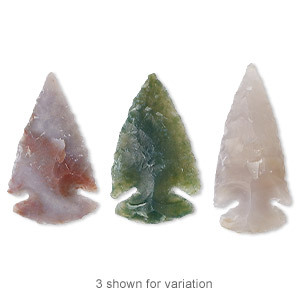 Focal, fancy jasper (natural), 2x1-1/4 to 2-1/2 x 1-1/2 inch hand-knapped arrowhead, B- grade, Mohs hardness 6-1/2 to 7. Sold per pkg of 4. 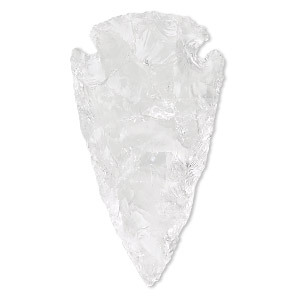 Focal, quartz crystal (natural), 1-1/4x3/4 to 1-1/2x1-inch hand-knapped undrilled arrowhead, B- grade, Mohs hardness 7. Sold individually. 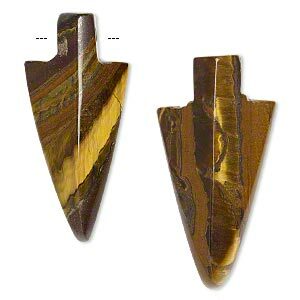 Focal, fancy jasper (natural), 2-1/2 x 1 to 3-1/2 x 1-1/4 inch hand-knapped arrowhead, B- grade, Mohs hardness 6-1/2 to 7. Sold per pkg of 2. Focal, quartz crystal (natural) and silver-plated copper, 35x22mm-41x23mm hand-knapped wire-wrapped arrowhead with 7mm jump ring. Sold individually. 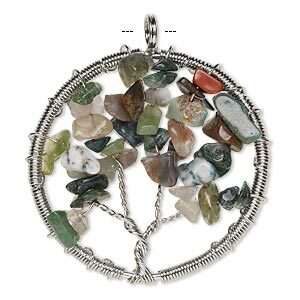 Focal, fancy jasper (natural) and silver-plated brass, 55x52mm round with wire-wrapped tree design. Sold individually. 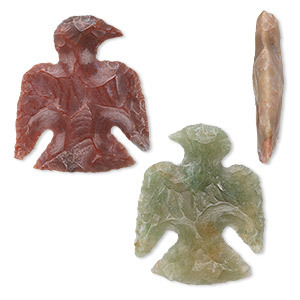 Focal, fancy jasper (natural), 38x31mm-43x36mm hand-knapped undrilled thunderbird, C grade, Mohs hardness 6-1/2 to 7. Sold per pkg of 3. 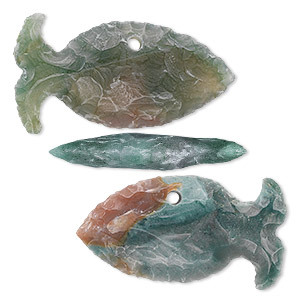 Focal, fancy jasper (natural), 44x24mm-49x29mm hand-knapped flat fish, B grade, Mohs hardness 6-1/2 to 7. Sold per pkg of 3. 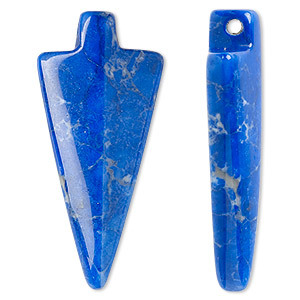 Focal, howlite (dyed), lapis blue, 40x18mm arrowhead, B grade, Mohs hardness 3 to 3-1/2. Sold per pkg of 2.